OCB Mode (base class for OCB_Encryption and OCB_Decryption). Note that OCB is patented, but is freely licensed in some circumstances. "OCB For Block Ciphers Without 128-Bit Blocks" (draft-krovetz-ocb-wide-d3) for the extension of OCB to block ciphers with larger block sizes. Definition at line 31 of file ocb.h. Definition at line 185 of file ocb.cpp. Definition at line 161 of file ocb.cpp. 174 * by this implementation. Definition at line 58 of file ocb.h. Referenced by Botan::OCB_Encryption::finish(), Botan::OCB_Decryption::finish(), Botan::OCB_Encryption::process(), Botan::OCB_Decryption::process(), set_associated_data(), update_granularity(), and valid_nonce_length(). Definition at line 187 of file ocb.cpp. References m_cipher, m_L, and reset(). 190 m_L.reset(); // add clear here? Implemented in Botan::TLS::TLS_CBC_HMAC_AEAD_Decryption, Botan::CTS_Decryption, Botan::TLS::TLS_CBC_HMAC_AEAD_Encryption, Botan::OCB_Decryption, Botan::CBC_Decryption, Botan::CCM_Decryption, Botan::EAX_Decryption, Botan::SIV_Decryption, Botan::GCM_Decryption, Botan::OCB_Encryption, Botan::CTS_Encryption, Botan::CFB_Decryption, Botan::ChaCha20Poly1305_Decryption, Botan::SIV_Encryption, Botan::CCM_Encryption, Botan::XTS_Decryption, Botan::EAX_Encryption, Botan::GCM_Encryption, Botan::CBC_Encryption, Botan::CFB_Encryption, Botan::ChaCha20Poly1305_Encryption, and Botan::XTS_Encryption. Referenced by botan_cipher_update(), and Botan::TLS::write_record(). Definition at line 223 of file ocb.cpp. Implemented in Botan::TLS::TLS_CBC_HMAC_AEAD_Decryption, Botan::CTS_Decryption, Botan::CBC_Decryption, Botan::TLS::TLS_CBC_HMAC_AEAD_Encryption, Botan::CCM_Decryption, Botan::OCB_Decryption, Botan::SIV_Decryption, Botan::EAX_Decryption, Botan::GCM_Decryption, Botan::CTS_Encryption, Botan::SIV_Encryption, Botan::OCB_Encryption, Botan::CCM_Encryption, Botan::ChaCha20Poly1305_Decryption, Botan::CBC_Encryption, Botan::EAX_Encryption, Botan::GCM_Encryption, Botan::ChaCha20Poly1305_Encryption, Botan::CFB_Mode, and Botan::XTS_Mode. Definition at line 213 of file ocb.cpp. 215 return m_cipher->name() + "/OCB"; // include tag size? Implemented in Botan::TLS::TLS_CBC_HMAC_AEAD_Decryption, Botan::CBC_Decryption, Botan::TLS::TLS_CBC_HMAC_AEAD_Encryption, Botan::CCM_Decryption, Botan::OCB_Decryption, Botan::SIV_Decryption, Botan::EAX_Decryption, Botan::CTS_Encryption, Botan::GCM_Decryption, Botan::SIV_Encryption, Botan::OCB_Encryption, Botan::CCM_Encryption, Botan::XTS_Decryption, Botan::ChaCha20Poly1305_Decryption, Botan::CBC_Encryption, Botan::EAX_Encryption, Botan::GCM_Encryption, Botan::XTS_Encryption, Botan::ChaCha20Poly1305_Encryption, and Botan::CFB_Mode. Referenced by botan_cipher_output_length(), and Botan::TLS::write_record(). Definition at line 59 of file ocb.h. Referenced by Botan::OCB_Encryption::finish(), and set_associated_data(). Definition at line 60 of file ocb.h. 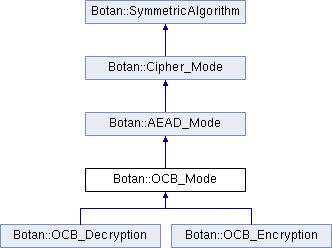 Implemented in Botan::OCB_Decryption, Botan::CBC_Decryption, Botan::EAX_Decryption, Botan::GCM_Decryption, Botan::OCB_Encryption, Botan::CFB_Decryption, Botan::ChaCha20Poly1305_Decryption, Botan::XTS_Decryption, Botan::EAX_Encryption, Botan::GCM_Encryption, Botan::CBC_Encryption, Botan::CFB_Encryption, Botan::ChaCha20Poly1305_Encryption, Botan::XTS_Encryption, Botan::TLS::TLS_CBC_HMAC_AEAD_Mode, Botan::SIV_Mode, and Botan::CCM_Mode. Referenced by Botan::TLS::check_tls_cbc_padding(), and Botan::TLS::TLS_CBC_HMAC_AEAD_Encryption::set_associated_data(). Definition at line 194 of file ocb.cpp. References m_ad_hash, m_block_index, m_checksum, and Botan::zeroise(). Definition at line 234 of file ocb.cpp. References block_size(), BOTAN_ASSERT, BOTAN_STATE_CHECK, Botan::copy_mem(), m_ad_hash, m_block_index, m_checksum, m_cipher, m_L, name(), par_blocks(), tag_size(), valid_nonce_length(), Botan::SymmetricAlgorithm::verify_key_set(), Botan::xor_buf(), and Botan::zeroise(). Definition at line 44 of file ocb.h. Referenced by Botan::OCB_Encryption::finish(), Botan::OCB_Decryption::finish(), and set_associated_data(). Definition at line 218 of file ocb.cpp. Referenced by Botan::OCB_Encryption::process(), and Botan::OCB_Decryption::process(). Definition at line 203 of file ocb.cpp. Referenced by Botan::Salsa20::cipher(), Botan::CTR_BE::cipher(), Botan::RC4::cipher(), Botan::SHAKE_128_Cipher::cipher(), Botan::ChaCha::cipher(), Botan::Poly1305::clear(), Botan::SHACAL2::decrypt_n(), Botan::MISTY1::decrypt_n(), Botan::IDEA::decrypt_n(), Botan::SM4::decrypt_n(), Botan::CAST_256::decrypt_n(), Botan::SEED::decrypt_n(), Botan::KASUMI::decrypt_n(), Botan::CAST_128::decrypt_n(), Botan::Twofish::decrypt_n(), Botan::DES::decrypt_n(), Botan::Noekeon::decrypt_n(), Botan::XTEA::decrypt_n(), Botan::Blowfish::decrypt_n(), Botan::DESX::decrypt_n(), Botan::Threefish_512::decrypt_n(), Botan::Serpent::decrypt_n(), Botan::Lion::decrypt_n(), Botan::TripleDES::decrypt_n(), Botan::GOST_28147_89::decrypt_n(), Botan::Blowfish::encrypt_n(), Botan::KASUMI::encrypt_n(), Botan::Twofish::encrypt_n(), Botan::XTEA::encrypt_n(), Botan::SM4::encrypt_n(), Botan::CAST_256::encrypt_n(), Botan::MISTY1::encrypt_n(), Botan::DESX::encrypt_n(), Botan::Noekeon::encrypt_n(), Botan::CAST_128::encrypt_n(), Botan::SEED::encrypt_n(), Botan::DES::encrypt_n(), Botan::SHACAL2::encrypt_n(), Botan::IDEA::encrypt_n(), Botan::Threefish_512::encrypt_n(), Botan::Serpent::encrypt_n(), Botan::Lion::encrypt_n(), Botan::TripleDES::encrypt_n(), Botan::GOST_28147_89::encrypt_n(), Botan::OCB_Encryption::finish(), Botan::OCB_Decryption::finish(), Botan::GHASH::ghash_update(), Botan::CFB_Encryption::process(), Botan::CFB_Decryption::process(), Botan::Salsa20::seek(), Botan::CTR_BE::seek(), Botan::ChaCha::seek(), set_associated_data(), Botan::Salsa20::set_iv(), Botan::ChaCha::set_iv(), Botan::GHASH::update(), Botan::GHASH::update_associated_data(), Botan::CFB_Mode::valid_nonce_length(), and Botan::ChaCha::write_keystream(). Definition at line 69 of file ocb.h. Referenced by Botan::OCB_Encryption::finish(), Botan::OCB_Decryption::finish(), reset(), and set_associated_data(). Definition at line 66 of file ocb.h. Definition at line 68 of file ocb.h. Definition at line 63 of file ocb.h. Referenced by clear(), Botan::OCB_Encryption::finish(), Botan::OCB_Decryption::finish(), key_spec(), name(), and set_associated_data(). Definition at line 64 of file ocb.h. Referenced by clear(), Botan::OCB_Encryption::finish(), Botan::OCB_Decryption::finish(), key_spec(), and set_associated_data().